Shoreditch’s biggest hotel openings in recent times, is taking form ahead of its grand opening in May. The latest hotel from New York hotelier Michael Achenbaum, who is behind the city’s Gansevoort hotels, will not only include 120 rooms and suites, but also a subterranean members’ club, wellness area, the first outpost of Red Rooster Harlem restaurant and – the showstopper – a rooftop pool and restaurant to rival that of neighbour Shoreditch House. The purpose-built red-brick building, which was formerly the site of a 1970s office block, is located on the corner of Curtain Road in the heart of Shoreditch. The hotel has a real sense of place: windows in the lobby frame the brutalist multi-storey car park across the road, while the twinkling office towers of the neighbourhood give an urban panorama from the rooftop. The hotel is home to one of the most highly anticipated restaurant openings in the city: Red Rooster. The original outpost in Harlem New York, by chef Marcus Samuelsson (Barack Obama is a fan), is known for its indulgent soul food – the likes of gumbo, chicken and waffles and short ribs – and its Sunday night parties. Though the head chef of the Shoreditch branch is still to be confirmed, the menu will offer a specially tailored menu to London as well as its own live music events, including a weekend brunch accompanied by a gospel choir. Red Rooster will also open up its first ever taqueria, located next to the lobby, which will offer food and drink all day, from huevos rancheros for breakfast through to late-night tacos and tequila. Upstairs on the rooftop is LIDO, the hotel’s other restaurant. If Red Rooster is all about rich soul food, then up here is a more classic affair, with traditional brasserie dishes. The plant-filled conservatory, which is lined by the heated pool, will fully retract in summer. There will be a total of eight bars dotted around the property, including one in the small garden courtyard, plus a barman with a drinks trolley will come to rooms from 5pm to 7pm to mix cocktails for guests. 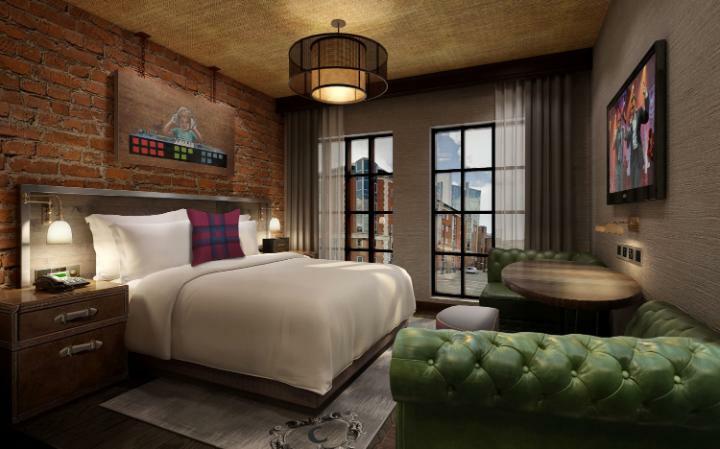 Exposed brick walls, hardwood flooring, black-framed factory windows and custom-designed artwork will feature in the hotel’s rooms and suites. Entry-level Courtyard rooms will look into a light well and come with separate toilet and a large shower room, while loft suites – the best in the hotel – will have their own large terraces with more urban views. The members’ club, which will not be open to hotel guests (except for the gym and wellness area), will have its own soundproofed live music venue, a Studio 54-esque underground club with chess floors and a sparkly gold bar. It will host live performances including gigs, readings and secret events, as well as BOOMCYCLE spinning classes in the morning. Alongside Billy’s Bar – a ‘louche’ late-night den – there will also be a co-working space on the ground floor of the property (the latter will open in autumn), one of the only spaces of its kind in a London hotel. The wellness area will have a weekly changing rotation of London's best therapists. The members’ club has had lots of enquiries from locals about membership for The Curtain, whose main rival is Soho House’s Shoreditch House, just a few streets away. The Curtain Hotel and Members Club, 45 Curtain Road, London EC2A 4PJ, opening early May. Courtyard rooms from £240.